Equipped with steel tubular frame and base for extreme durability. Resin panels with sound-absorbing foam lining dampen noise. The automatic power system adjusts engine speed to meet power requirements and reduce noise while increasing fuel efficiency and engine life. The muffler design provides optimum sound reduction and includes a U.S. Forest Service-approved spark arrestor. Large, three-layer steel fuel tank delivers longer run times between refills. A fuel shut-off valve is controlled by a large switch on the front panel to make it easy to service the carburetor or transport the generator. 12-volt DC battery charging capabilities allow for external battery charging. 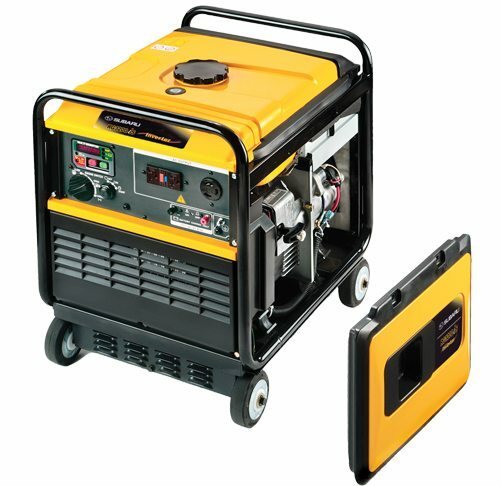 Single-dial control allows the operator to choke and run the generator and turn off the fuel valve. A multi-monitor display keeps the operator informed of the voltage output, frequency and hours of operation. It also alerts the operator if an overload condition occurs. An OSHA-compliant Ground Fault Circuit Interrupter (GFCI) ensures operator safety. Overload protection stops the output of power to the receptacles in case of overload Compliant in all 50 states. Large, translucent fuel-sediment and strainer cups filter water and debris to prevent material from entering the engine carburetors. The cups are easy to remove and clean. A low-oil shutdown function kills the engine when a low oil level is detected. Electric Start makes for easy, no hassle startup. Every Inverter generator is powered by a Subaru Over-head Cam engine.